Question. 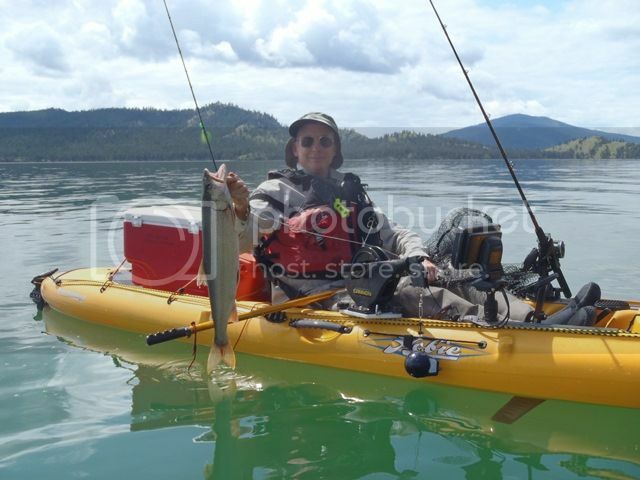 As a catch and release (usually) long-time mountain states' Hobie driver and team member, keeping the occasional fish for dinner is not a problem as I use a Float Well for the few times needed. However, the first week of August, I will be doing my first Rancho Leonaro trip to Mexico. Our whole crew are Mirage addicts but this is the first time for all of us in the salt in a yak although we all have lots of salt experience in normal ocean craft. We would appreciate any info on how to keep our edible fish fresh. We are doing rentals so can't make any modifications to the PAs. Help! It has a removable inner liner and can keep my catch and my water cold for the 6 hr trips I usually do. I usually use some recyclable freezypacks that my wife gets in her food deliveries, but a bag of ice would do just as well if not better. The best way to keep either salt water or fresh water fish fresh is by bleeding them and then putting them on or in crushed ice or ice cubes. I strap a cooler in my rear cargo area for this purpose. 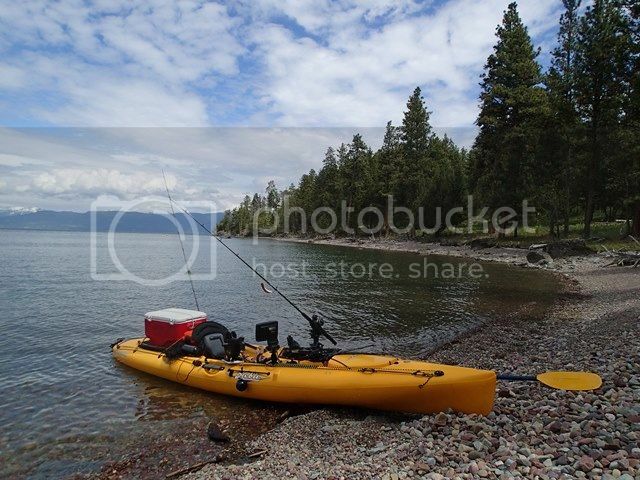 A couple of suggestions about using a cooler on a Hobie kayak: A disadvantage of the rear storage area on Hobie kayaks is that the rear hatch is mounted at the back of the storage area at an angle, which reduces the length of the storage area which has a flat bottom. Find a cooler which has wheels at the back. The bottom of these coolers usually steps up 2 or 3 inches in the area of the wheels. This higher area will extend back over the hatch, which allows you to fit a larger cooler in the rear storage area. Note to Hobie kayak designers: Move the hatch back further, and increase the length of the rear storage area which has a flat bottom! If the cooler doesn't have a bombproof latch, strap the top down with a bungie, so you won't lose your fish if you flip your kayak. When I'm fishing for fish which may exceed the size of my cooler, such as pike or lake trout, I put them in the front hatch of my kayak. I've insulated the area under the hatch with closed-cell foam, I lay a couple of flat ice bottles on the bottom of the storage area, and I put a jumbo-sized heavy-duty garbage bag containing ice cubes on top of the bottles. 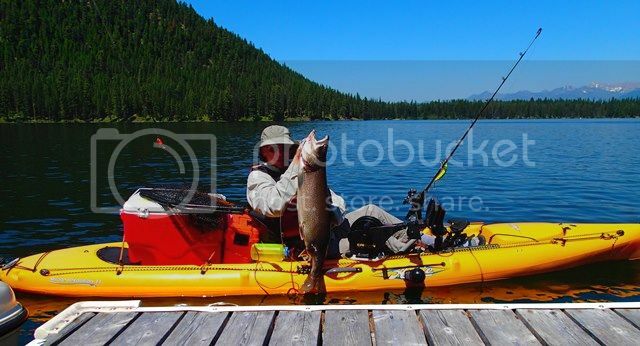 I have to scoot forward in the kayak and reach over the pedals and various items of fishing gear to load a fish in the front hatch, but it's worth the hassle to keep a big fish fresh. Ice Mule makes a pretty good and well-insulated end loading fish bag which you could put in the rear storage area, but I'm not a big fan of end-loading fish bags. What I'd really like is a big well-insulated top-loading (duffle-style) fish bag, and I've urged the Ice Mule people to develop one. Note to Ice Mule designers: Get going with this idea! You could make a much better kayak fish bag than any other bags currently on the market!